Happiness Is A Warm Cookie | Put Your Damn Pants On! This week has been…tough. A couple of weeks ago, I went to my boss and did the craziest thing I may have ever done – I offered to do way more work than I’m paid to do. I think I had some sort of breakdown, or an alternate personality surfaced, or controlled by government aliens. I basically said, “You know how I’m completely overwhelmed by my current job responsibilities? I think everything might be easier if I took on some extra work!” See? CRAZYTOWN. So, that all started on Monday and I ended up logging a bunch of overtime (a bunch = any at all). On top of that, my guy was out of town this weekend. He left on Friday. I’ve been home alone with the boys since they got off the bus. All the stuff in the previous paragraph about work being insanely stressful? I’m REALLY looking forward to getting back to it. I am exhausted in a way I don’t think I’ve ever been before. I don’t want to go to sleep yet because it’s actually quiet and I’m basking in silence. Anyways, when I’m this stressed out, I sometimes (always) turn to food (I eat my feelings!). And yesterday I made two dozen beautiful, perfect, delicious chocolate chip cookies. Do you see how thick they are? They’re still amazingly soft and light and chewy without the weird undercooked feeling I always get from store bought soft baked or chewy cookies. They aren’t dry. They aren’t crumbly. They are exactly the right mix of buttery and sweet and chocolatey. 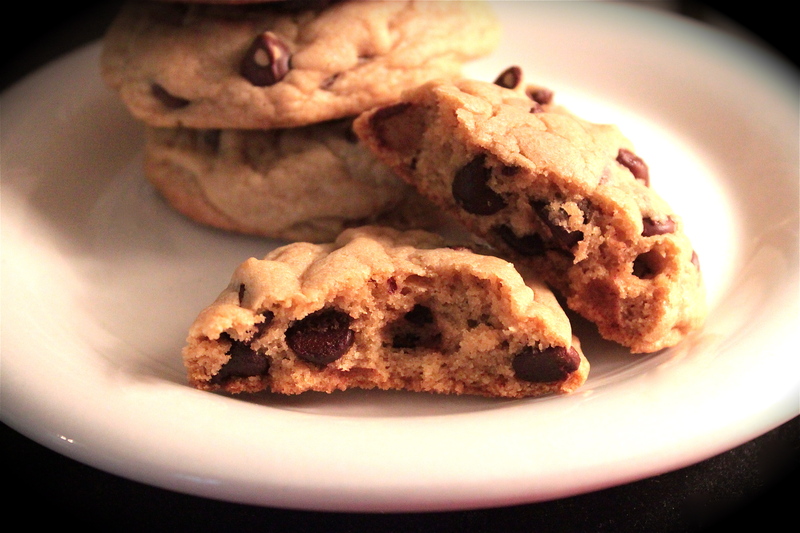 I honestly don’t believe I’ll ever make a better batch of chocolate chip cookies. The recipe comes from my favorite cookbook, The America’s Test Kitchen Family Cookbook. If you don’t own this, do yourself a favor and get it. Everything I’ve made from it has been amazing. It’s an excellent resource, even if I find a recipe on the Pinterest, I’ll usually see if the ATK has any input. (I really like researching and cross referencing because I’m a neerrrrrrrdd.) It has a little bit of everything and plenty of tips, tricks and product recommendations. It’s the bee’s knees, the cat’s pajamas, the…you know, the thing’s stuff. Beat butter and sugars on medium speed about 2 minutes (you want it fluffy). Beat in eggs, yolks and vanilla until combined, about 30 seconds. Slowly mix in the flour until combined. Mix in the chocolate chips. The dough is going to be soft. The recipe calls for 1/4 cup of dough per cookie; this is too much for me. Try it, if it’s too much, do less next time. Place the balls (heh) on a parchment lined baking sheet. You want your balls to be a little deformed (heh heh eww), not perfectly round and solid. Don’t handle the balls too much (heh heh sigh); remember the dough is really soft. Bake 17 to 20 minutes, rotating the pans halfway through. The edges should be just browned, but the cookie is still soft and puffy. Cool on the baking sheet for at least 10 minutes – the extra time on the hot sheet finishes the baking process. Eat them all. Weep with joy. Forget your sorrows.